Place the 4 ½ cups chicken stock in a medium sauce pan. Bring to a boil, stir in the wild rice and turn down to a simmer. Cook until the rice is soft and starting to split, about 45 minutes. Turn off heat, cover and set aside until needed. Place the 2 ½ cup chicken stock in a small sauce pan, bring to a boil and then stir in the brown rice. Reduce to a simmer and cover. Cook until tender, about 40 minutes. Remove from heat and drain. Place the brown rice and wild rice in a large mixing bowl. These can be cooked and refrigerated the day before. Preheat an oven to 375 degrees. Toss the butternut squash with olive oil, salt and black pepper. Put it on a baking sheet and into the oven, roast for about 15-20 or until tender. Remove from the oven and add to the rice mixture. The squash can be cooked and refrigerated the day before. Heat a small saute pan over medium heat, add 2 tablespoons of olive oil or butter and then add the spices. Saute for 1 minute stirring often, then add the onions. Cook for 2-3 minutes, to soften and then add the garlic. Continue cooking for 1 more minute then add the Riesling & orange juice. Simmer until the liquid is reduced by 2/3, remove from the heat and add the dried fruit. Toss to coat and then let rest for 15 minutes. Then add to the rice mixture, along with the 1 Tbs of lemon juice and 2 Tbs of extra virgin olive oil. Season with salt and pepper to taste and then put the dressing in a buttered casserole dish. Cover and put in a 350 degree oven for 35 minutes. Remove from the oven, stir in the cup of chopped pecan and then top with the green onion. 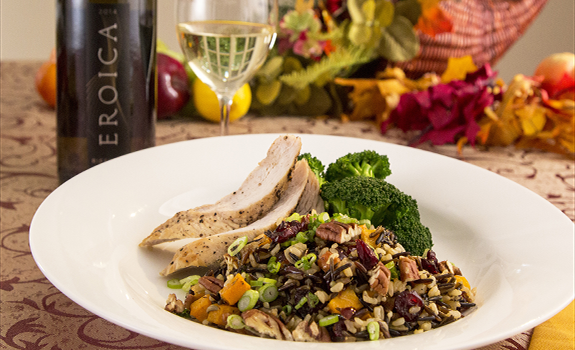 Serve as a side dish with your holiday turkey and with Eroica Riesling!